Never lose power when on the go again! Keep your devices at the ready with this convenient charger. 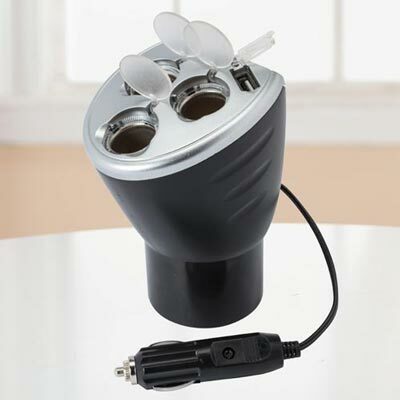 Fits into most vehicle cup holders and includes a built-in 10 amp safety fuse. Charges up to 3 - 12v accessories and 1 USB device with glowing ports for easy use, even in the dark. 4"w at top, 16"l cord stores in base.